The New First stage decompression board for Acetylene for Glass production is studied to ensure the best efficiency and safety. The system is produced following technical standards UNI EN ISO 14114, UNI EN ISO 2503, IGC DOC123/04E e UNI EN ISO 730 and it is built as expected by UNI EN ISO 11114-1 e UNI EN ISO 11114-2 for compatibility, brass (low percenta-ge of copper) and stainless steel for metallic parts and PTFE for non metallicones. The decompression board is completely pneumatic and is studied to operate with a by pass system for pressure regu-lators in order to ensure a continuous work, even during maintenance service. 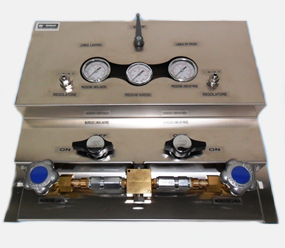 On outlet it is installed a specific flashback arrestor for the best protection of the acetylene cylinders. This it to be con-sidered mandatory to guarantee the best safety for the per-sonnel. Pressure regulators are specific to feed rigid piping system in orderto avoid any risk of pressure or flow rate drops. the aim of this system is the best efficiency and safety! With the decompression board we will supply conformity declaration and test report.